Paper automata have a long tradition, dating back to the 19th century. Today paper modelling is enjoying a renaissance. More and more people have discovered a love for building these little works of art, as the models can be built in a few hours, but bring delight for many hours thereafter.The Red Knight and his noble horse stand guard. Threatened, he springs to attention, rearing his horse and raising his sword, ready to defend his honour. This model has been created by Walter Ruffler, one of Europe's most accomplished modern day automata designers. Build this paper machine and experience crank mechanisms at work. 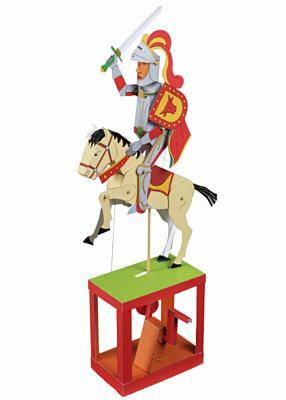 In Red Knight, the rotation of the handle is converted by a crank slider into the movement of horse and knight. The horse rears, the knight straightens up in his saddle and raises his sword. The left foreleg of the horse and the knight's arm are operated by threads and move in unison when the crank is turned. This paper machine kit contains three construction sheets printed with the model parts, kebab and cocktail sticks, and fully illustrated step by step instructions. The model requires scoring, cutting, folding and glueing. Items you will need to provide - a pair of scissors, a craft knife, a ruler, glue (white school glue is fine), a push pin, a needle and a piece of thread. Suggested for ages 12+ These are challenging kits to construct, and will take a good few hours!